Sports fans are fickle. So is the sports media. And while that’s certainly no industry secret or recent development, it does seem like that fickle behavior has worsened in the 24/7, social media era of sports. When an athlete is playing well and/or their team is winning, fans and media sing their praises and forgive their flaws. (At least that’s usually how it goes. Some athletes, like No. 1 NFL draft prospect Jameis Winston, would tell a different story.) When an athlete isn’t playing well and/or their team is losing, fans are much more critical and much less forgiving. Once upon a time, not long ago, Manchester United midfielder Marouane Fellaini had a dark cloud of negativity from fans and media residing over his head just like his signature brown Afro. The 27-year-old Moroccan-Belgian Muslim came to Man U in 2013 as an expensive transfer from Premier League (England) club Everton. Since then Fellaini had not performed up to expectations. And as anyone who pays attention to sports can attest, the higher an athlete’s salary, the quicker fans are to turn on one of their own. Fellaini has been especially lauded for his play during Man U’s 4-2 victory over rival Manchester City on April 12, in which he scored a goal and helped keep Man City midfielder Yaya Toure, one of the best players in the world and a fellow Muslim, mostly ineffective. At the end of the Mirror article on Fellaini was a poll for readers asking if they considered Fellaini an undroppable (invaluable) commodity. A few weeks ago, that poll would have returned close to 100 percent in the “No” column — many Man U followers wanted Fellaini gone, in fact. 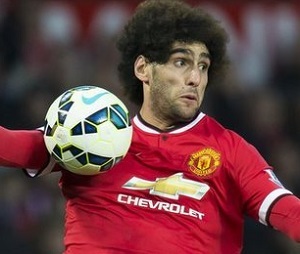 But at last check, 75 percent of the respondents now believe Fellaini is too good to let go.